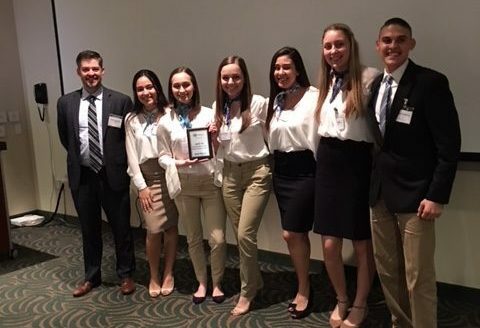 The third annual Florida Business Plan Competition was held on February 6, 2018 at the H. Wayne Huizenga College of Business & Entrepreneurship at Nova Southeastern University in Ft. Lauderdale. Thirteen firms from nine schools around the state participated. Keynote speaker, Neal Asbury, CEO of The Legacy Companies, started off the general session. Mr. Asbury has published hundreds of articles on worldwide trade issues and hosts a nationally-syndicated radio show, “Neal Asbury’s Made in America.” Neal is an inspiring speaker and told the students that they should follow their passions and never give up. Failure often is followed by success. Mr. Asbury was followed by Nick Chapman, President and National Program Director, VE, who welcomed the students and their teachers to the competition. The morning competitions ran simultaneously in three different rooms. We had four judges in each room. The judges included four executives from HSBC bank, four college professors from Nova, the Assistant Dean from Farmingdale State College on Long Island, several retired business executives, and a former VE student, Cesar Gonzalez, who is now VP of Corporate Development at Marlin Gold Mining, Ltd. All of the judges were impressed with the professionalism of the students and the quality of their presentations. The three top presenters from the morning session competed in the afternoon finals in front of the entire assembled participants and guests. The winners are as follows: First Place – TropiCoffee from Cooper City High School; Second Place – New Wave Travel from Clearwater High School; Third Place – Live Wild from Cooper City High School. TropiCoffee will be representing Florida at the 2018 National Business Plan Competition in April. All of the students, teachers, judges and guests expressed what a wonderful day they had. We are looking forward to an even larger event next year when more firms prepare to compete. On behalf of the VE, we would like to say a big thank you to the supporters who contributed their time and talent judging for the 2018 Florida Business Plan Competition. The success of the competition would not have happened without their help. Thank you to Nova University for hosting the event!